Alumna Abby Young-Powell has been named Most Promising Newcomer at the CIPR Education Journalism Awards. Abby Young-Powell (MA Interactive Journalism, 2012) won the CIPR award following a series of articles she wrote for the Guardian about sexual violence experienced by students. The winning articles include a feature highlighting student stories and a piece on consent classes for students. She also wrote an article that inspired Hollaback London's Good Night Out campaign and led to better training to help bar staff deal with sexual harassment. Abby started working for the Guardian after she graduated from City University London in 2012 and now writes for the paper's Students and Education section. She said of winning the award: "I'm really grateful to win most promising newcomer and to have my work recognised in this way. Sexual violence at university is an issue that shouldn't be ignored or normalised. I'm pleased that these features have helped to bring the issue to light and to spark conversation." She added: "I feel lucky to be able to write about things that matter to me and studying for a Masters in Interactive Journalism at City helped me to get to where I am now. Winning this award is a really good boost to have at the start of my career." City alumna Christine Alsford (PG Diploma Periodical Journalism, 1989) was also recognised for her work as the runner-up in the Regional Award category. Tom Felle, Acting Director of Interactive Journalism said, "There are more than 5,000 City alumni working at all levels of journalism globally, from reporters at local beats to the editors of global media brands. We are a globally connected network of media professionals and we are immensely proud of award winners such as Christine and Abby. Both have demonstrated their commitment to the highest professional standards as well as the pursuit of excellence in journalism, something we value highly at City." 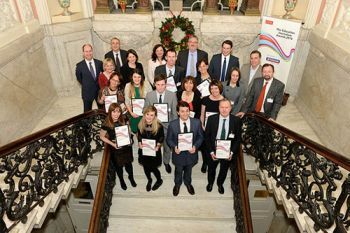 The CIPR Education Journalism Awards celebrate the most talented journalists in the field of education and were presented at Dartmouth House in Mayfair during December.